Amish Paste- HEIRLOOM! Old Amish heirloom from the turn of the 20th century. 7-8 ounce tomatoes are ideal for paste, canning, sauces and slicing. Provide support by staking or caging. In fall cover to protect from frost. Indeterminate. Arkansas Traveler- popular variety that is a heavy producer of 7 oz. round fruits. Delicious pink tomato that does well even in high heat. Artisan Lucky Tiger- excellent Artisan cherry tomato variety that is sweet and tart to the taste. Green stripes become defined as the fruit ripens on this elongated, red blush tomato. Beefsteak- one of the most popular tomato varieties. Vigorous vines grow an abundance of extra large, somewhat ribbed fruits with rich flavor. Great for slicing. Provide support by staking or caging. Indeterminate. Better Boy- one of the most popular tomatoes grown in the U.S. A classic slicer variety with superb flavor. Vines need to be staked. Big Beef- full flavored, mostly blemish-free large 10-12 oz. fruits. One of the best tasting tomatoes and they ripen early for their size. Globe shaped red fruit has broad disease resistance. AAS winner. Indeterminate. Big Rainbow- Heirloom! Giant fruits weighing up to 2 lbs! Beautiful tomato that has a striking yellow and neon red striping appearance when sliced. Bing- every plant is loaded with sweet and delicious cherry tomatoes. Perfectly balanced acid and thin skin. Indeterminate. Black Cherry- One of the only round, black cherries available with a characteristically dark purplish color. One inch fruits average 1 to 1.5 oz and are great with the sweet, rich, full flavor common to all of the Russian black tomatoes. Black Krim- Heirloom! This Russian beefsteak variety has a smokey, bold flavor and an unusual dark appearance with good texture. Brandywine Red- HEIRLOOM! One of the best tasting tomatoes. Luscious flavor and large 1 lb. fruits make this a sure winner! Brandywine Yellow- Heirloom! Golden flesh is smooth, juicy and delicious! This variety has a creamy texture and harvests large fruits weighing up to 2 lbs. Celebrity- 8-12 oz., firm, crack resistant fruits with excellent flavor grow on strong, heavy yielding vines. Provide support by staking or caging. In fall cover to protect from frost. Determinate. Chadwick Cherry- mouthwatering, large red fruit on indeterminate, vigorous, highly productive and disease resistant vines. Cherokee Purple- HEIRLOOM! Very unusual variety with full flavor! Medium-large fruit with a dusky pink color with dark shoulders. Copia Beefsteak- unique fine-lined stripes of golden-yellow and candy-red make this tomato an amazing sight. Large fruits average 12-16 oz. with sweet flavor and swirling color throughout. Indeterminate. Cosmonaut Volkov- popular Ukrainian variety with a sweet and tangy flavor that seems to win every taste competition. Slightly flattened red fruits have a rich and complex taste. Prolific variety that produces high yields even in cooler conditions. German Johnson- an outstanding variety with deep pink, excellent tasting fruits. Early maturing, heavy yielding, medium sized uniform fruits with a delicious flavor and creamy texture. Glacier Saladette- very early variety with high yields of juicy, 2-3 oz. orange-red saladette tomatoes. Great for the small garden or containers. Gold Nugget- bright yellow cherries produce early and abundantly on compact plants. One inch fruit are juicy with a mild flavor. Golden Sweet Grape- crack-resistant deep yellow fruits produce long clusters on vigorous plants. Indeterminate. Ground Cherry, Goldie- an exotic garden treat! Ground cherries, with their papery husks, tropical flavor and treasure hunt harvest experience add a little bit of magic to your garden. Bushy plants. Green Zebra- HEIRLOOM! A green striped specialty salad tomato. Delicious and tangy, ripe when the green fruit develops a yellow blush. Hillbilly- HEIRLOOM! These colorful 2 lb. beefsteak tomatoes are orange and yellow striped with red and pink. High yielding. Husky Red Cherry- a highly popular, super sweet cherry tomato with high yields and good looks. Its dwarf size makes for a great fit for small gardens and containers. Indigo Rose- darkest tomato bred, very high in anthocyanins antioxidants. Green when unripe, purple-red when ripe. 1-2 oz. cocktail tomatoes on compact indeterminate plants. Iron Lady- exhibits triple resistance to the three main tomato diseases. A mid-size slicer with good tomato flavor. Determinate plants do not require trellising. Jaune Flamme- Heirloom! French saladette tomato that will win you over with it's sweet and fruity flavor. Prolific variety makes for a terrific salad tomato. Juliet- fruits are crack resistant and wonderfully sweet. These are as soft and juicy as cherry tomatoes and very disease tolerant. Lemon Boy- hybrid variety with a striking appearance and a slightly tangy flavor. Marglobe- 5-6 oz. deep scarlet colored fruits are globe shaped, uniform and make for great canning. Good disease resistance. Matt's Wild Cherry- HEIRLOOM! This is a variety that must be included in Summer salads - an old variety and very reliable. Mortgage Lifter- Heirloom! Gigantic tomatoes average 2.5 lbs. each and can weigh up to 4 lbs! Wins taste tests year after year. Developed by a gardener in the 1930's who sold them for $1 each, ultimately paying off his mortgage in 6 years. Moskovich- Heirloom! Early and abundant 4-6 oz. deep red fruits with outstanding flavor. Commonly used for canning and cooking. Tolerant of cooler temperatures. Mountain Princess- Heirloom! Crowd pleasing flavor and 8-10 oz. perfectly round fruits. Early, productive and great for containers. New Girl- widely adapted, indeterminate variety with 4-6 oz. red fruit that shows good disease resistance and has excellent flavor. Good early variety. Pink Berkeley Tie-Dye- Beefsteak-type tomato with psychedelic pink and green striped fruit. Remarkable flavor and appearance. Compact plant produces early. Pruden's Purple Beefsteak- HEIRLOOM! Rivals Brandywine as the best-flavored heirloom tomato. Not really purple but rather a deep pink with slight shoulder ribbing. Fruits are large often close to 1 lb. each. Indeterminate plants with potato-shaped leaves. Red Pear- high yields of perfectly shaped, bright red fruits. Firm, sweet tomatoes that you can eat right off of the plant. Indeterminate. Riesentraube Grape- HEIRLOOM! This vine produces long clusters of bright red baby grape tomatoes. They have become a favorite of people everywhere due to their sweetness! Add compost at planting. Roma- vigorous and high yielding plum tomato with excellent flavor and great disease resistance. Mild flavor. Excellent for sauce making. Rutgers- bright red fruit with a small seed cavity make this a winner for canning and slicing. Big time flavor and meaty texture. San Marzano- HEIRLOOM! Open pollinated Italian heirloom variety. Large yields of red, 3½" long, paste tomatoes with meaty, full flavored flesh and few seeds. Provide support by staking or caging. Indeterminate. Striped German- bicolor red and yellow fruit. The marbled interior is very attractive when sliced. Sun Gold- arguably the best tasting tomato of all. Attractive golden fruits which have a very high sugar content are ideal for salads & snacks. Sun Kissed Orange- an orange slicer that is as sweet as the reds! Perfectly unblemished fruits with a sought after taste. Super Sweet 100- round 1" fruits are bursting with flavor! Plants can yield up to 100 fruits per cluster. 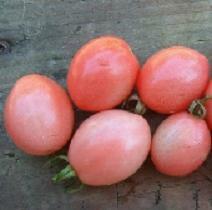 Sweetie Cherry- the large vine produces very sweet, red cherry tomatoes. The high sugar content makes this a good variety for preserves. Or enjoy a handful any time. Add compost at planting. Thai Pink Egg- indeterminate variety that produces a pink fruit, which resembles an egg. Great taste, unique presentation and excellent storage. Tomatoberry Garden- these desirable fruits have a sweet flavor and a beautiful heart-like shape. High yields and meaty texture. Indeterminate. Valencia Orange- HEIRLOOM! Attractive orange fruits with full tomato flavor. Yellow Pear- HEIRLOOM! Yellow pear shaped fruit are thick skinned and crack resistant. Beautiful addition to salads, salsas and sandwich's. Yellow Taxi- meaty, 4-6 oz., baseball-sized, lemon-yellow tomatoes. Attractive and easy to grow. A prolific, low acid tomato suitable for the home gardener.